along with men in uniforms and stately long jackets. People came from miles around to attend these formal gatherings. Simply stated, a cotillion is a formal party, dinner, or dance dedicated to the purpose of introducing young Southern debutante’s into society by their families. 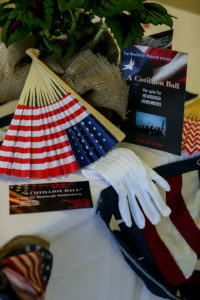 Historically families hosted grand balls in their homes, but over time the tradition developed where country clubs and other organizations took over the growing responsibility of hosting the party. The “Newburgh Remembers” weekend cotillion ball is sponsored by Stoll Keenon Ogden, PLLC and Commonwealth Engineering and will kick off our weekend of festivities. The decorations, music, and setting of the occasion will make you feel as though you’ve been transported back in time to the 1860’s. When: July 20, 2018. Cocktails (cash bar) will be available from 5:30 p.m. to 6:30 p.m, dinner will take place from 6:30 p.m. to 7:30 p.m. with music and dancing from 7:30 p.m. to 9:30 p.m. Dress: Period attire is suggested, but is not required. .
Music: We’re fortunate to have Newburgh’s own Old Dam Community Band providing music from the Civil War era. The band consists of over 100 musicians and has performed for over 600 public and private events. Their music is a mix of Americana, nostalgic, military and patriotic tunes. Cost: General admission tickets cost $45.00, tickets. General Admission tickets may be purchased through Event Brite by CLICKING HERE. Questions may be directed to: Leanna Hughes, 812-598-5500.